Lucca, Italy. Could This Tuscan Town Be Our “Some-Day-Home”? Maybe it’s a game that all travelers play. The “Could I live here?“ game. As soon as my feet hit the ground in a new town or city, I begin debating the pros as well as the cons and dreaming about how it might feel to call this new place home. I have a “Sure, Let’s Give It a Try” list featuring a healthy number of cities. There’s a far more extensive “Nope, Not for Us” list. But, now, after years of traveling and living our lives in one place after another, there’s a very short – and ultra sweet – “I Can See This Being Home” list. Lucca tops that last category. A practical city, easily reachable from Florence (two hours via train,) Pisa (less than an hour via train,) and the beach and mountains via bus or bike, Lucca is an ideal base for exploring Tuscany as well as the rest of Italy and Europe (thanks to cheap regional flights out of Pisa). However, it must be said, I’ve never been too concerned with practicalities. The reason to fall in love with Lucca is similar to the reasons you fall in love with a partner. It feels right. There’s a magic about the green hills surrounding the medieval town walls that has been referenced for centuries by historians and writers alike. From its beginnings that are believed to be Etruscan, through its Roman era, years as an important silk producer and independent republic to its Napoleonic and Bourbon rule, and through to present day, a thread of myth and mystery runs through Lucca. That thread is what brought our friend Pablo here on vacation from Chile twelve years ago. He has yet to leave. That same thread brought Matt and me for our first visit. A trip that will forever be known by the “middle of the street” incident. We fought in the open-air, for all to see, with such passion, because I refused to leave Lucca, even if it meant missing our flight the next day from Florence back to the U.S. (See what I mean about practicalities)? I lost that argument, by the way. Ask Puccini and I’m sure he too would tell you about strong emotions. The composer of La Bohème and Madama Butterfly, was born in Lucca and created most of his work in the surrounding hills. He’s heralded and celebrated through every quarter of the town today. As one of the gems of Tuscany, Lucca is famous for its Renaissance era walls that today serve as a pedestrian promenade turning the entire city into a public park. It’s equally famous for its striking tower houses built by wealthy local families as a symbol of status and power. Unlike many beautiful Tuscan towns, Lucca celebrates its layered past without seeming stuck in time. There’s a youthfulness and vibrancy that sets it apart. It’s a city alive with artists and musicians boasting dozens of diverse cultural events throughout the year. Every walk through town revels another innovative new artistic endeavor taking shape within this well-preserved historic setting. It’s a beautiful combination of ieri, oggi, domani (yesterday, today, tomorrow). A few hours before leaving I felt that same sadness from last time bubbling up. Instead of standing defiantly in the street saying that I wouldn’t leave, this time I decided to savor my last moments, accept the sweet sadness, and leave knowing that I would be back. Who knows, one day I may call it home. For both of our visits, we have stayed in our friend Pablo’s beautiful historic city center apartment. If you go, give him a hug for us. Trust me, he’ll like it. Fortified Walls of Lucca – Whether it’s by foot, bike, or family carriage (yes, these are for rent all over town,) you must experience life on the walls. They are 4.5 km around and the best way to get a feeling for the city. We found ourselves on the wall at various points during the day: a morning run, an afternoon picnic, and evening passegiata. 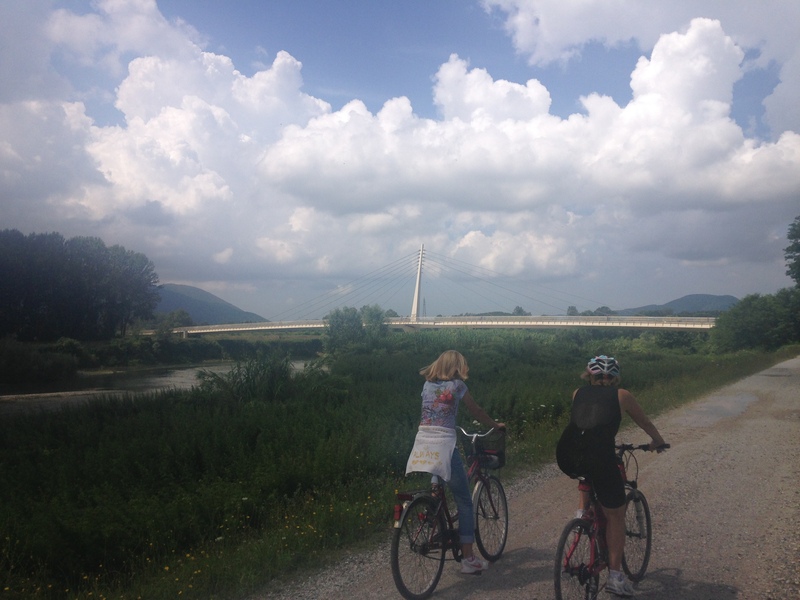 Rio Serchio – The river is a short bike or walk from Lucca’s city center and features miles of trails along both banks. Not surprisingly, the bank nearest Lucca is most crowded but if you cross the bridge to the opposite side, you’ll practically have the trail to yourself. 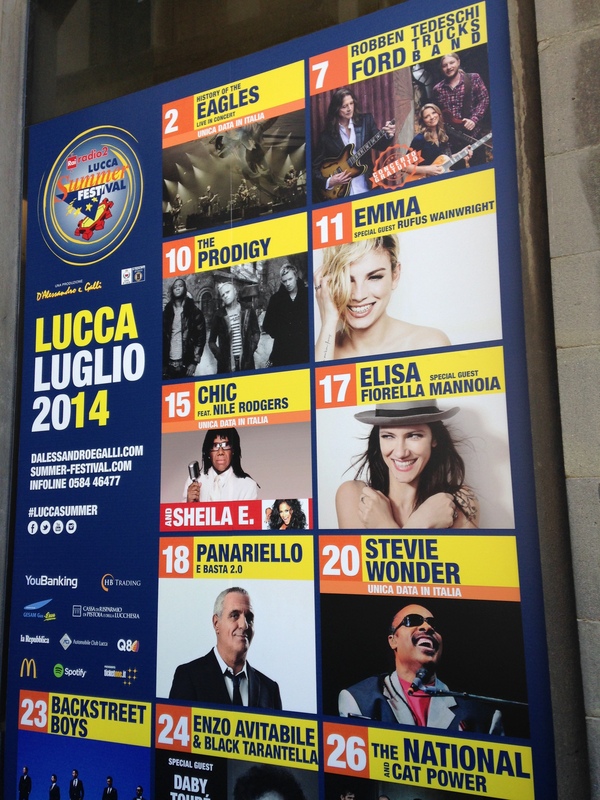 SUMMER FEST – This music series features international superstars and local favorites in an amazingly small and scenic setting in one of Lucca’s historic plazas. Seeing any artist here would be a real treat. Puccini Festival Concerts – The Church of San Giovanni presents Puccini themed concerts on a regular basis in its beautiful piazza. What an amazing way to celebrate the music of this great composer in the place of his birth. Rent a Bike – You will truly feel like an outsider if you don’t. 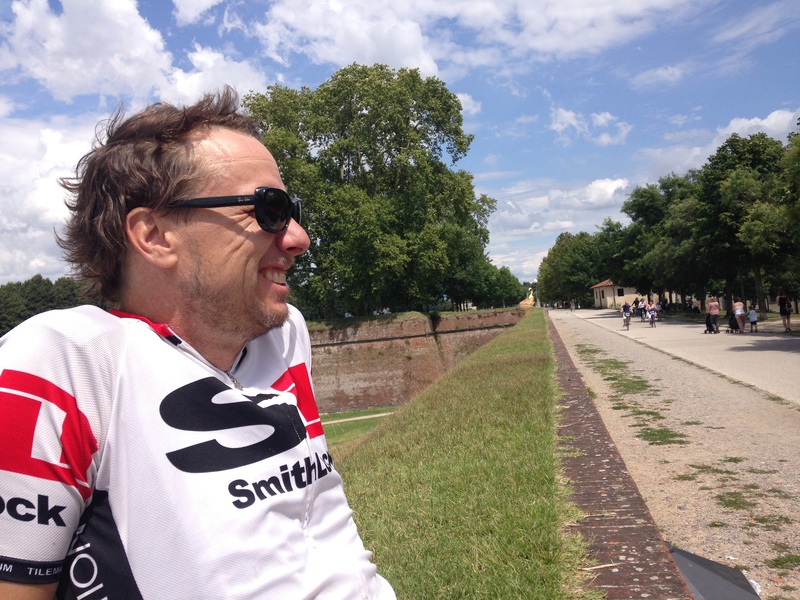 EVERYONE in Lucca, including little old signoras in skirts and support shoes, ride bikes around town and along the walls. Torre Guinigi – Walking around the wall, you’ll catch site of this tower and its rooftop garden and the site will take your breath away. For a literal breath catcher, you can climb the 230-ish steeps to the top for yet another awe-inspiring view of Lucca. Osteria Pasqualino Gubitosa – This is the kind of restaurant where you aren’t sure whether the greater joy was savoring the delicious dishes or chatting with the owner. A native of Sicily, Pasqual has made his home and built his reputation in Lucca. His place is simple yet sophisticated and heavy on meaningful touches. 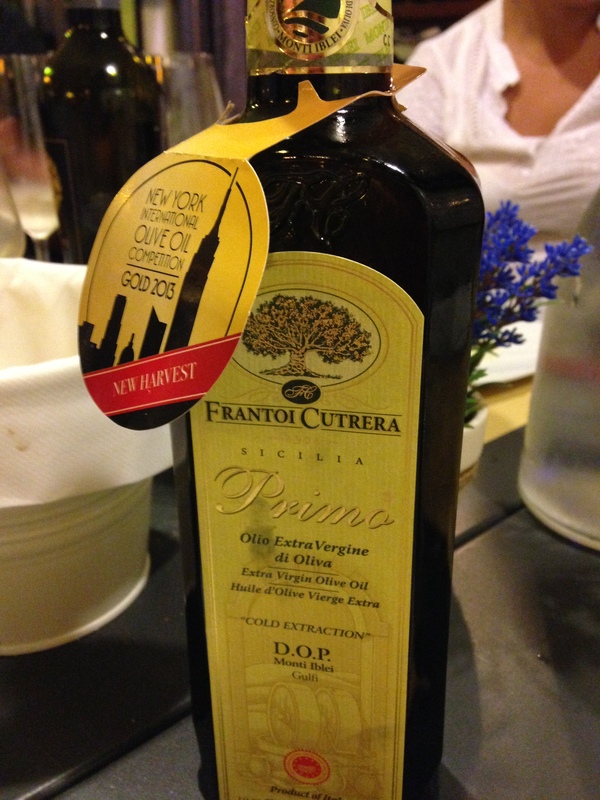 Our meal began with a tasting of two olive oils; one Lucchesian, one Sicilian, both international award winners. Course after course followed of the most delicate dishes of regional pastas and seafood. We left with full bellies and a bag of award-winning olive oil. 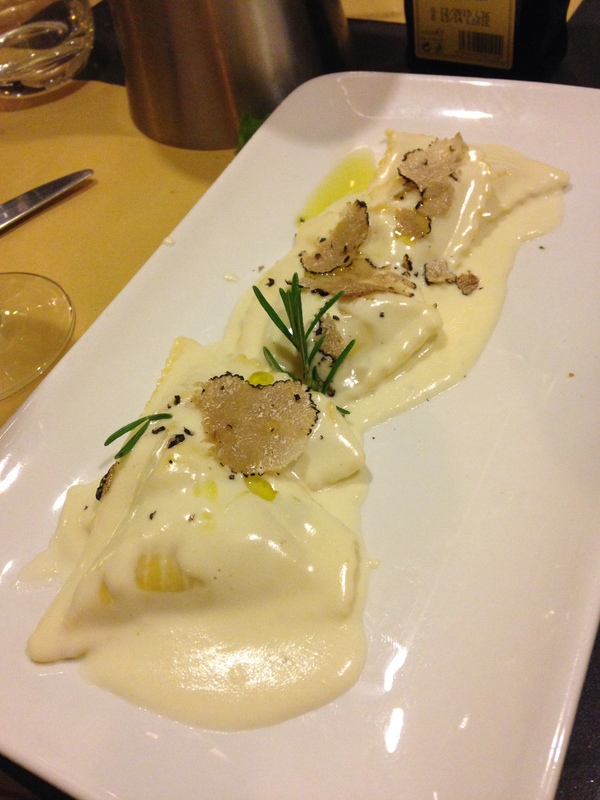 Trattoria Da Giulio – This was our second visit to this revered family trattoria. It’s not as atmospheric as many of Lucca’s offerings, but it makes up for it with authentic and delicious regional specialties, huge portions, and good prices. Be sure and check out the photos lining the walls featuring famous Italian politicians and personalities. Vineria via Busdraghi – This place has everything you hope for in a neighborhood tavern. Great wine and beer choices, friendly bartenders, dedicated locals, free bar snacks in the afternoon, and late night food. You’ll feel like a local in no time. 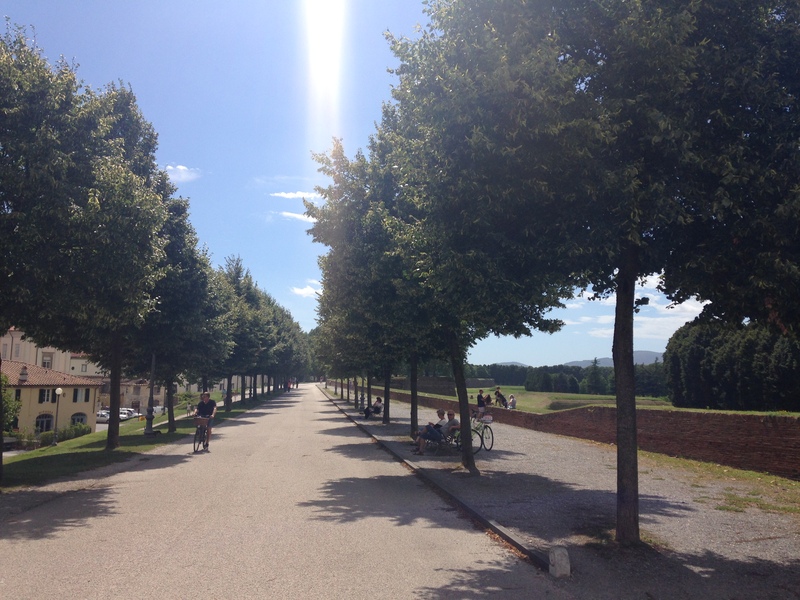 After our first visit to Lucca – even with the heady emotions of a “street fight,” – we chose to return again the following year, and the year after. 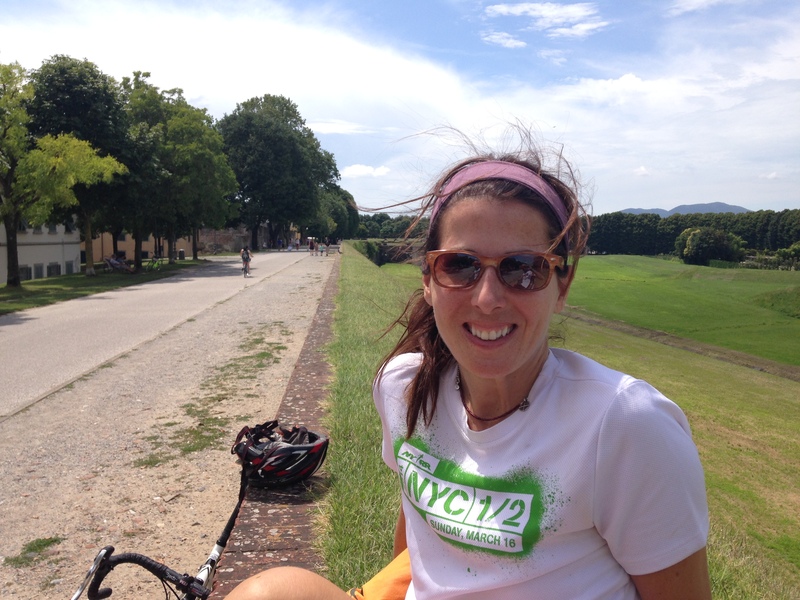 This immersion inspired me to write a “Lucca Travel Guide” for American magazine Paste. The link is included below. I hope you enjoy the read and find some inspiration of your own. 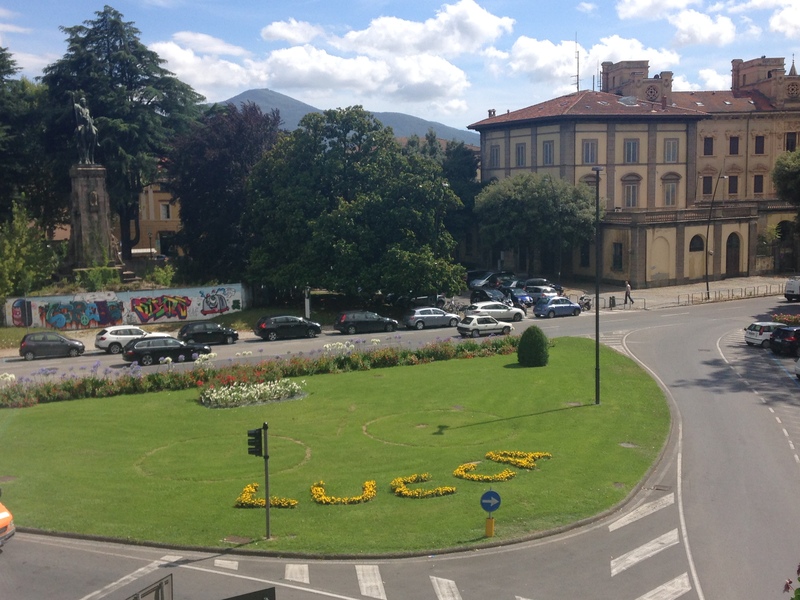 Seeing Lucca for the first time, visitors describe the feeling a bit like falling in love. The town’s physical beauty is almost overwhelming. With a Roman core dating to 180 B.C. surrounded by Renaissance-era walls and rolling green hills, this Tuscan jewel shines brightly at first blush and more so with each embrace. Simply said, Lucca coos with charm and whispers of romance. But the true magic comes from the juxtaposition between historic beauty and Lucca’s youthful spirt. The cobblestone streets provide a dramatic backdrop for rotating contemporary art installations and pop-up markets, which offers travelers an opportunity to experience a town’s past while being part of its modern evolution. Sounds delightful—You expressed my feelings when I set foot in Israel. That’s nice, Ruth. I’m glad the post made you think of Israel. It’s on our list to visit and when we do I’ll be reaching out to you for advice. 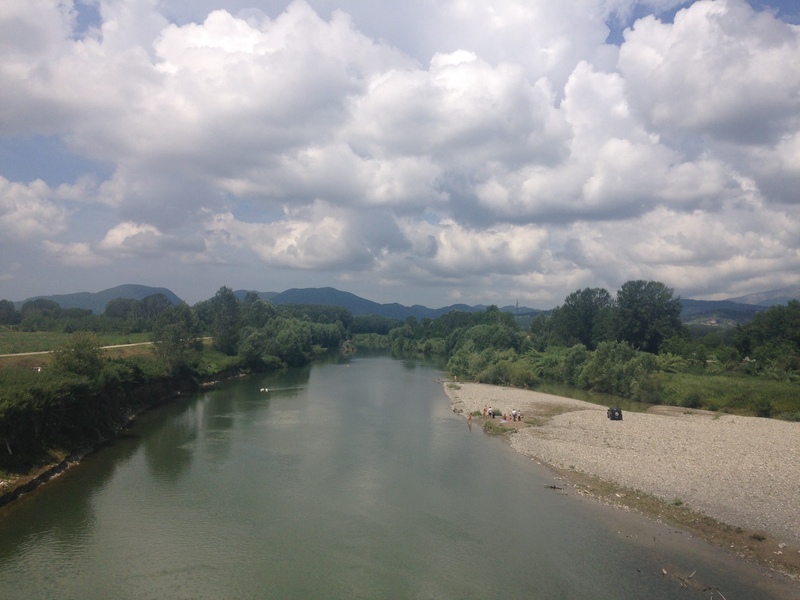 Pingback: Pietrasanta, An Artist Colony along the Tuscan Coast. Here’s What to Know & Why To Visit this Fascinating Town. Pingback: Sometimes in Life, You Have to Dive into the Deep End. And, Finding Home.